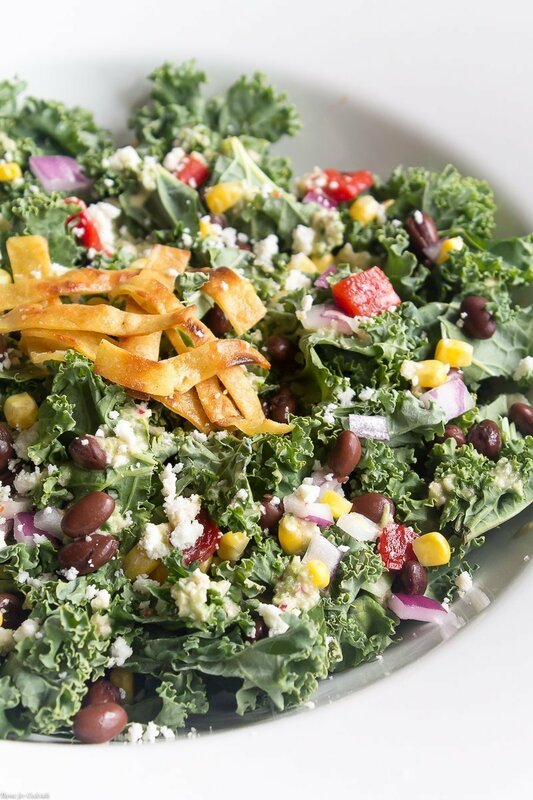 A hearty Southwestern Kale Chopped Salad is the perfect way to satisfy your cravings for a healthy salad full of south of the border flavors. 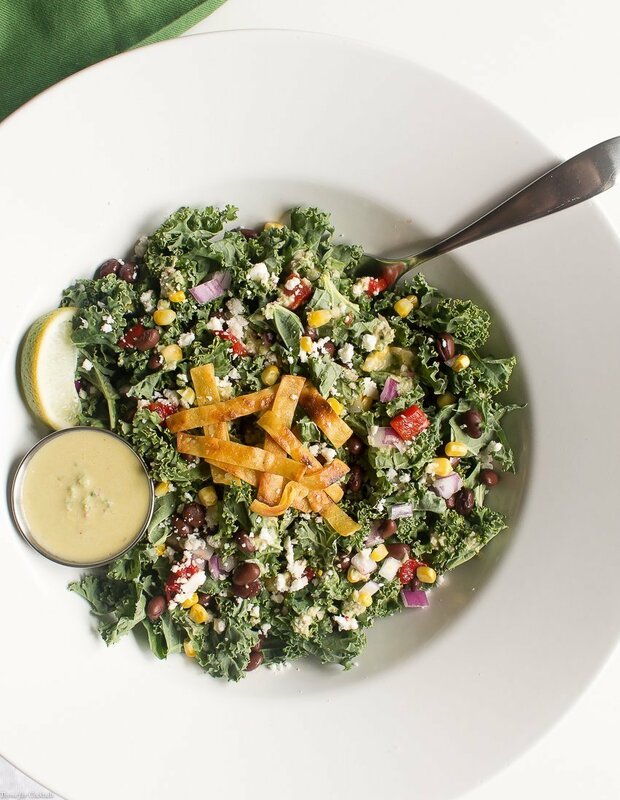 Corn, roasted red peppers, black beans, and crispy tortilla strips with a hint of lime make this a great spring salad. If you follow me on social media, then you know we have been eating out wayyyy more than usual. Between foodies events with the #cbusfoodbloggers group to great places like The Kitchen, and weekend cookouts with friends, we haven’t been home much. I love the people we are meeting, and the great places we are eating. Needless to say though, and my pants agree, I need to get back into the casa kitchen for some healthier food choices! 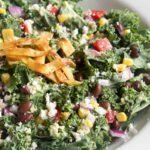 This Southwestern Kale Chopped Salad embodies pretty much everything I miss about my foodie peeps in Arizona. Kale will always remind me of Guy from On The Vine Farms. It’s earthy, dependable, and surprisingly lighthearted, just like he is! 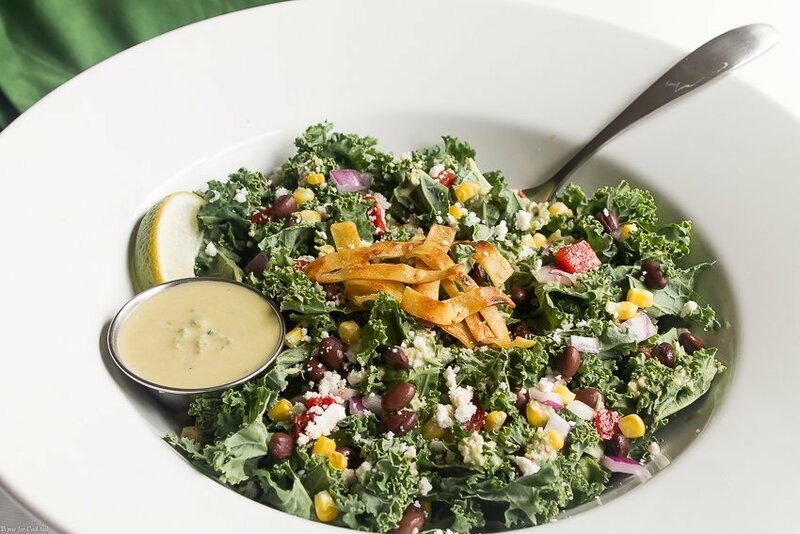 And you know we can’t go wrong with salad mix-ins like corn, black beans, and bell peppers. It all reminds me of Sunday morning at the farmers market, chatting with vendors, and snacking our way through a seasonal smorgasbord of product. To top it all off, a Creamy Poblano Garlic Vinaigrette is the perfect dressing for this seasonal salad, the recipes will be up shortly! You could also do a light chili lime, or even a Honey Lime Vinaigrette. Anything light, with tart citrus flavors will really balance the heartiness of the salad. At the last-minute I decided to add crunchy little strips of corn tortillas. You can buy them pre-made from some grocery stores, or lightly pan fry your own at home. A squeeze of lime juice and a sprinkle of kosher salt make them irresistible. 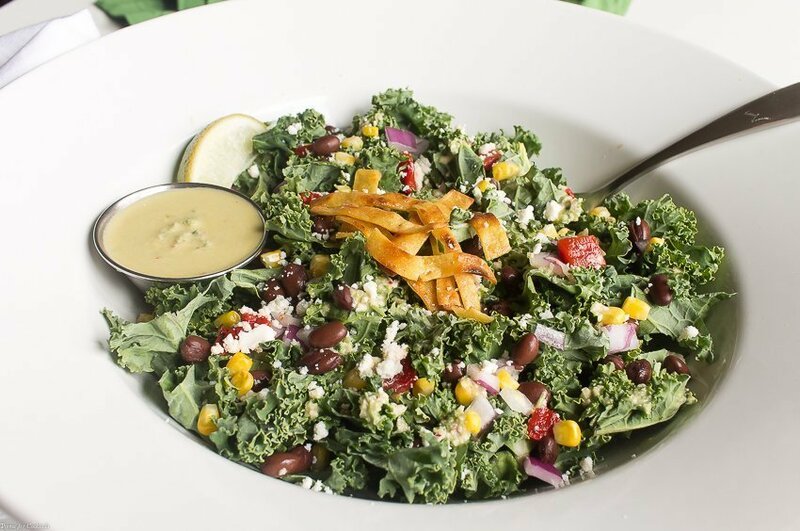 What is your favorite go-to salad? Now that the weather is warming up, what produce are you excited to see at the farmers markets again? Heat oil in a large skillet over medium heat. Cut tortillas into 1/4 inch by 1 inch strips. Add strips to pan, toss occasionally. Cook 3-4 minutes until crispy. Drain on a paper towel lined plate. Squeeze 1 lime wedge over strips, sprinkle with kosher or sea salt. Toss all vegetables together in a large bowl. Top with crumbed cheese, desired dressing, and tortilla strips. Serve remaining lime wedges with salad.